Where Are You Hiding Charlie Dog? 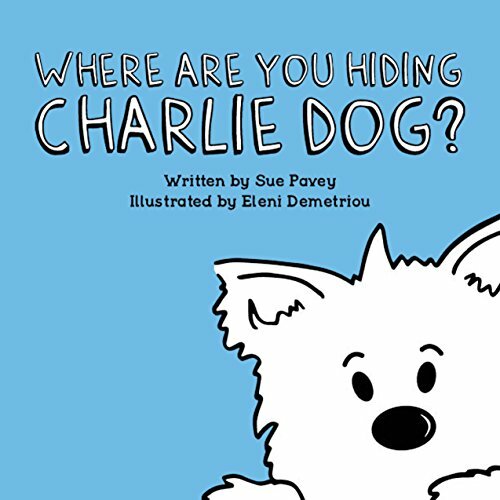 Follow Charlie Dog’s new adventure and guess where the most lovable, mischievous, little Westie Dog might be hiding in this fun and easy to read, rhyming picture book by Sue Pavey and Eleni Demetriou. Sue Pavey lives in Blackheath, South London and is married with two grown-up children. Her venture into writing began in 2012 when her first children’s picture book ‘The Alphabet Friends and their Animals’ was published. A year later Sue had an idea to write a series of books based on her own little West Highland Terrier called Charlie and in 2014, working with illustrator Eleni Demetriou, the first book in the series “Charlie Dog” was published. The book has received great reviews from the national & local press, along with positive endorsements from celebrities such as HRH Duke & Duchess of Cambridge, Robbie Williams, Elton John and Gabriel Vicks to name just a few. Sue is an active member of her community and carries out story readings at the local schools throughout the year. “Charlie Dog” has a great social media presence and has a YouTube page, Facebook and twitter page too. Sue Pavey’s own website will be live this 2017. Sue hopes children will continue to love following the adventures of “Charlie dog” in the many books still to come. A superbly entertaining book for children. This story takes the reader on a mystery tour of finding the most lovable little dog called Charlie. His owner is looking for him and finally finds him at the end of the story. The illustrations are wonderful and the book is a real delight for any child to read with or without the help of an adult. There is even a page at the back where Charlie Dog invites the reader to colour in the hot air balloon with Charlie sitting in the basket. A great book for children to interact, learn new vocabulary and have fun! Highly recommended! Vote/comment for this book NOW - Once you cast your vote for this title you cannot vote for it again – the system will reject your vote. This is such an entertaining and lovely book for young children and it really deserves to win! It is a fab book for the little ones! A great little children’s story with fun illustrations. Fantastic concept and superb book for the little ones! Part on my 11 month olds bedtime routine is a story with his bottle. This has quickly become one of our favourite stories. Fabulous book,good story telling,and good illustration ,my granddaughter absolutely loved it. Wonderful children’s book a delight to read. Great book for children to read. Lovely book to read.My son loves his Charlie Dog book. I reckon many puppies will be called Charlie after reading this lovely book! Great book and lovely illustrations!